Your e-scooter does not have regenerative braking? Want to charge your batteries during brake? No need to change the main controller. Any modern e-scooter must have this functionality. 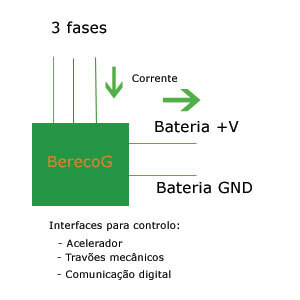 The system, Bereco-G will add this feature hassle free. The batteries stress is lower, because after a current drawn it will happen a current coming in. The mechanical brake is not used so often. The reg. braking will work for you. and road slope during trips). Braking is activated by brake handler, accelerator and/or digital communication interface. Soft and confortable braking as in electric cars (Nissan Leaf, Citroen C-Zero, Renault ZOE, etc). maximum braking power with a screwdriver.